Belize is the northern-most Central American nation. It is a constitutional monarchy with an estimated population of only 333,200. The total area covered by the nation is 8,867 square miles. As shown in the Belize Political Map, the country shares its borders with Mexico in the north, Guatemala in the south and west and Caribbean Sea in the east. The political map of Belize also highlights the national capital, major cities, districts, and international boundaries of the country. 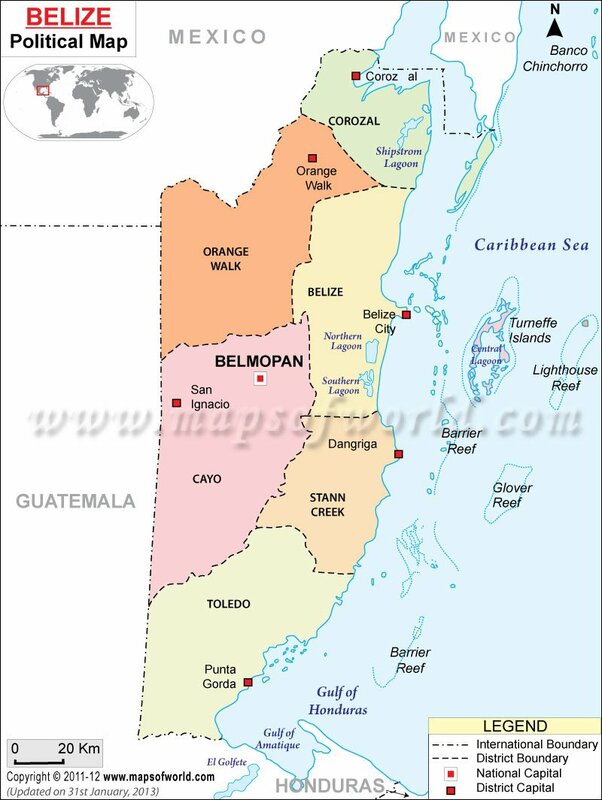 Belmopan is the capital of Belize and is indicated in the map with a red circle enclosed in a square. The city has an estimated population of 20,000. Belize City is the largest city in the country and has an estimated population of 79,600. It is the main port and the industrial hub of Belize. The other major cities shown in the map are: Benque Viejo, Corozal, Dangriga, Orange Walk, Punta Gorda, and San Ignacio. The country of Belize has been divided into six districts for better administration of the country. They are: Belize District, Toledo District, Cayo District, Orange Walk District, Stann Creek District and Corozal District. Each district is further divided into constituencies. Belize is a parliamentary democracy and a constitutional monarchy. Elizabeth II is the reigning monarch. She is represented by the Governor General. Sir Colville Young is the current Governor General. The Prime Minister is the head of the government; presently Dean Barrow is the prime minister of the nation. Note: Population: 2000-05-12 census (source ).